While providing information is the most important duty of a wedding invitation, there are many benefits or features that a wedding invitation can offer. For many couples, the wedding invitation is just one component of an interlinked and connected range of items, themes and aspects of the big day. For the bride and groom that is looking to create a certain style or mood at their special day, the style and nature of the wedding invitation can make all the difference. Any couple looking to create a sense of style and elegance will find that The Primrose Pocketfold wedding invitation from Pure Invitations, is the ideal way to inform guests of the upcoming event. 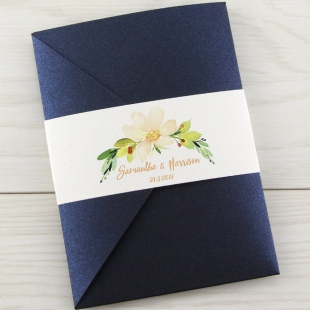 This is a luxurious wedding invitation, finished in navy, which comes wrapped with a floral belly band. This is the sort of invitation that guests will be delighted to receive and then take great pride in showing off to their friends and family members. A couple that wants their wedding to be regarded as one of the leading occasions of the year will find that this is the perfect invitation to set the scene. The floral design is completed within the invitational insert and there is the option of adding personalised information and even RSVP cards. 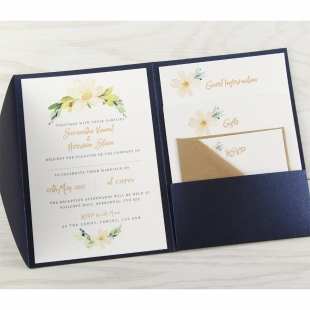 This invitation has a style and theme that you will want to feature throughout the big day and your celebrations, so you’ll be glad to know that there is a range of additional stationery items that included in the Primrose Pocketfold theme.